Organic foods are hard to define, but the general public tends to consider foods which are produced without the help of synthetic chemicals to be organic. 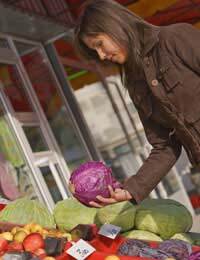 Recognising organic foods when you are out shopping can be difficult, but once you understand the basic standards and accrediting bodies your search should be made easier. Understanding the health benefits of eating organic, and how organic products differs from fairtrade products, should also help you make easier choices in the future. If at least 95% of ingredients are organic then the word may be used in the product title. If 70% - 90% of ingredients are organic then the word may be listed in ingredients. If less than 70% of ingredients are organic then the word may not be used at all. DEFRA - The Department for Environment, Food and Rural Affairs. OF&G - Organic Farmers & Growers. OFF - Organic Food Federation. Current research has revealed no great difference in nutrition or health benefits from eating organic food versus food produced in another way. This means that studies are unable to confirm if there is more or less nutrition/nutrients (vitamins, minerals, etc) in organic foods as compared to other foods. Research has proven though that different levels of chemicals may exist in foods which are produced organically and those which are not. It is assumed that more chemicals are present in foods which use chemicals to in fertilizers or to force ripeness in time for harvesting. How these chemicals could affect your health, or how pesticides used in food production could affect your health, is not yet conclusive. While organic foods are certified based on how they are agriculturally produced, fair trade foods and products are those which conform to international fairtrade standards. These standards have more to do with the economic production of the foods and products, including working with economically disadvantaged producers who may not have a fair chance in the traditional economic systems. Foods which carry the Fairtrade Mark have been sourced from producers in developing countries as certified by the Fairtrade Foundation. Though most people recognise eating organic as avoiding foods which are produced with synthetic chemicals there are many differences amongst organic foods. Understanding different definitions of “organic”, recognising the many different certifying bodies of organic foods, knowing more about the health benefits of eating organic and the differences between organic and fairtrade products should help you make more informed purchases in the future.